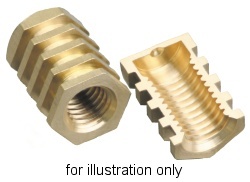 Anchor�s Torq range are economically priced hexagonal grooved metal inserts. Torq inserts are a good alternative for molders experiencing problems with standard round knurled inserts spinning during assembly or during use. For Torq inserts the hex size is typically 2mm larger across flats than the thread size, e.g. an M6 Torq insert will have an 8mm across flats hexagon. Torq blind inserts with a thread size M6 and above feature an internal recess at the bottom of the thread giving an unbeatable depth of thread relative to the overall length. Available as standard in brass with an extended range including stainless steel variants and non standard lengths. Contact us if you can't find the insert you are looking for. We have many sizes not listed here and with in house manufacturing offer fast turnaround on custom designs. All dimensions in mm, L is insert overall length and A is hexagon across flats.